A review of Keri Smith. The Imaginary World of _____ (Your Name Here). A Perigee Book/Penguin Group, New York: 2014. I never thought I would pull a Lady Catherine de Bourgh. In Pride and Prejudice Mr. Darcy’s imperious aunt declares her love of music with the words: “If I had ever learnt, I should have been a great proficient.” Yet here I am, stating categorically that The Imaginary World of _____ is a book I might have written, if only I had thought to do so! Keri Smith, a Canadian author-illustrator has beaten me to it. And no wonder. Smith is a self-described “guerilla artist” focused on “open works” completed by the viewer/reader/user. She has composed a slew of how-to books that fit the bill—The Imaginary World of ____ is one of the latest. 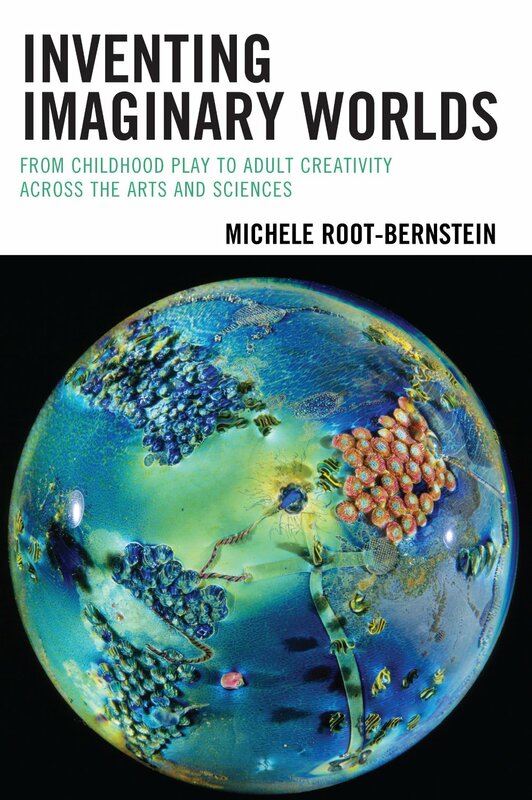 What I like about this book is the brass-tacks focus on how to imagine, invent, build and share your very own imaginary world. Like many another self-help book, this one provides inspiration. It also provides a road map and step-by-step instructions for those who may need it. Imagine a space, a place like the real world ought to be. Name it, map it. Describe its weather, its government. Design its homes, its history, and its language. Invent an imaginary persona. Conjure imaginary characters. Write stories, build model houses, compose music, and sing songs. Smith provides supportive tips aimed at nurturing you through the process: take time to be alone, to observe the world around you with all your senses. Don’t hesitate to start with something real and give it a twist. Borrow (or steal) good ideas from books, television, or twitter. Ask ‘what if’ and answer with your own art and craft. Smith targets her book at adults, particularly adults with a bent for writing or drawing or arts and crafts construction. As well as inspired amateurs and artists of all kinds, people working in the humanities, social sciences and public service professions can also find imaginary world invention stimulating and rewarding. Even scientists or engineers can find value in constrained world-building, albeit in terms of possible or probable agent-based systems. These latter groups may benefit from the ideas and strategies of this book, rather than its specific suggestions and prompts. No matter who gives it a try, the overall point of the enterprise remains. Smith works to draw people in with introductory pages on the power of imagination and utopian vision. “The act of creating a world,” she writes, “is an act of revolution.” It is certainly an act of idiosyncratic and original thinking—the kind at work in the best of art, science, technology and human affairs. The questions goading advances in knowledge and innovation are often cast in worldplay terms: What kind of world would you like to inhabit (politically, economically, or aesthetically)? What kind of world might we inhabit (at a molecular level, say, or in the virtual reality of a computer)? Posit the vision and, often enough, the skills, materials and investigative techniques necessary to acquire understanding fall into place. Despite Smith’s focus on artistic adults, The Imaginary World of ____ has a lot to offer children, too. To be sure, not as an act of revolution or a knowledge contribution to society, but as a powerful means of self-guided learning and creative development. Older kids can use the book on their own. Younger kids might need to rely on parents to pull out ideas and prompts one at a time. Teachers who want to build imaginary worlds in the classroom can adapt the overall plan to their own needs—adding lesson-driven problems to the elaborations of place and persona(s). For a refreshing dive into world invention, I recommend this book. What a creative way to play! This entry was tagged art, classroom worldplay, creativity, education, imaginary world invention, innovation, keri smith, paracosm, world-building, worldplay. Bookmark the permalink. « My first book review!